Having read a book by author Marieke Nijkamp before I knew I had to check out her new novel Before I Let Go. A completely different vibe, but a mystery which is right up my alley. One thing I will give Nijkamp is that these two novels I have read of hers both touched on hard hitting topics that are typically taboo. The first was school shootings and Before I Let Go touched on mental health. I love reading stories that go above the norm and have you finding yourself in territories undiscovered. I know some about mental health and the struggles that people go through, but reading different takes on it always gives me more insight. 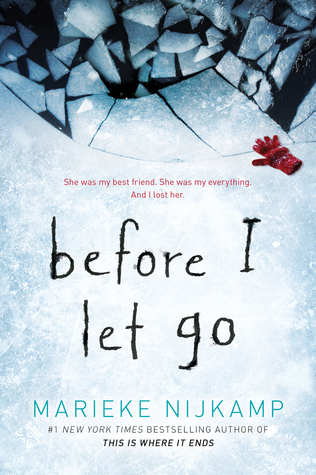 Before I Let Go follows Corey as she returns home to her tiny home town of Lost, Alaska to visit her best friend Kyra. Only Kyra died two days before Corey's arrival in an apparent suicide. Corey is sad and expects to be welcomed with open arms by the residence that all know each other so well, but it turns out she is unwelcome. Now labeled an outside the story follows Corey as she tries to piece together what happen to her best friend to lead her to suicide and why the town is acting so strange. From the first step on Lost soil I was intrigued. Corey was met with so much animosity even before she questioned what was happening that you knew there was something sinister lying beneath the surface. Corey's character was strong and brave, especially for a teenage girl. I would not have been able to handle the situation quite like her. Normally I am not a fan of flashbacks, but this story would not have made much sense without. Between occasional chapters we got a glimpse of Kyra and Corey in the two years or so leading up to the current timeline. These flashbacks gave us a glimpse as to what could have led Kyra to suicide or why the town was acting so strange. I mentioned how Nijkamp talked about mental illness. Kyra suffered from bipolar disorder and some other mental health conditions that stem from that, such as a deep depression. The flashbacks gave witness to how those highs and lows affected those around her and why some people just could not understand her personality, making her almost a pariah in the community. As the story continued we found out more about how those who did not understand Kyra's mental illness misconstrued things and forced her into ideas and actions they felt were making her happy. All of these things are topics that most don't talk about, let along write books about, but Nijkamp never backs away from them. I loved Nijkamp's view of mental illness and the twisted story that weaved itself around Kyra and Corey. I never knew who to trust at each turn and found myself actually gasping at times and having to take just one more minute to find out what happen next. Needless to say I finished this book in two days. A real page turner. It even had a cult like vibe to it at times with the townsfolk, which is not typically the type of story I would enjoy, but somehow all these aspects fit together to make a truly interesting, deep, spine tingling mystery. While it may be labeled YA Fiction, I feel Before I Let Go is a good novel for anyone who likes mysteries and wants to be surprised at the end. Definitely pick up a copy. Sign into Goodreads to see if any of your friends have read Before I Let Go.